The artist Ian Barry’s newest sculpture could easily be mistaken for a mere motorcycle. It is an impressive piece of hand-built machinery, but that’s not how Mr. Barry sees the newest creation in his Falcon Ten series. To him, his custom motorcycles exist on a different plane than the two-wheel conveyances people drive on public roads. His bikes are the gasoline-powered embodiment of living, breathing, moving art. In 1998, the Solomon R. Guggenheim Museum presented “The Art of the Motorcycle,” an exhibition that focused on vintage motorcycles as sculptural objects. The new exhibition “The White, the Black and the Kestrel” by Mr. Barry at the Michael Kohn Gallery in Los Angeles, adds fresh traction to that line of thought. 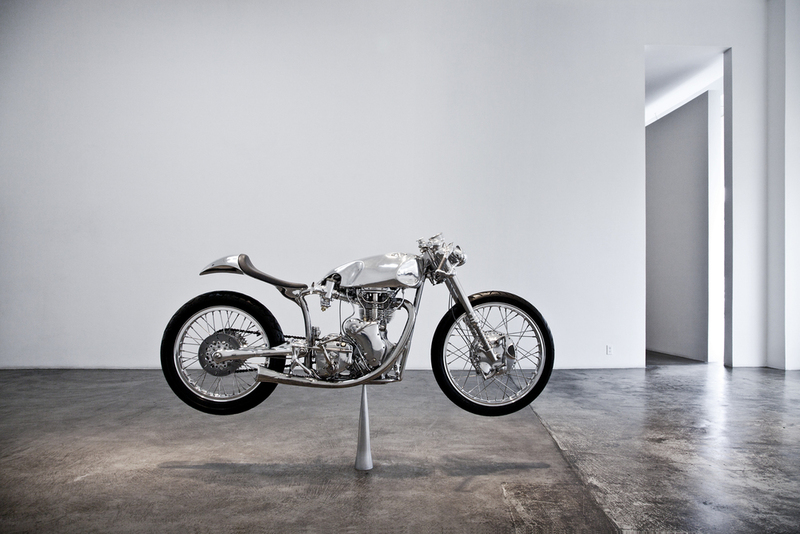 The exhibition includes three of Mr. Barry’s functional motorcycle sculptures. It also includes eight framed works he has culled from raw materials, including industrial clay, aluminum and solvent-dewaxed heavy paraffinic in his Los Angeles studio. The centerpiece of the show is the public introduction of the White, a completely custom motorcycle built around a a 1967 Velocette Thruxton “Squish head” racing engine, held above floor level at its center on a very slender cylindrical mount. It is the fourth motorcycle in Mr. Barry’s Falcon Ten series, a sequence of 10 custom motorcycles he plans to complete over the next several years. The three displayed at Kohn will be there until Aug. 31.